(WL3) Should we accept names written by some Rando as canon? While making some "Wolfenboss" sprites I looked at his Mario Wiki page. This is the supposed source for his name. A random walkthrough on a random old dead website. "Elude the smoke signals thrown out by Wolfenboss (for some reason, they're shaped like the Tao symbol) and wait for him to toss out spiked balls. The balls will metamorphose into these flaming enemies, which you can bash into Wolfenboss." Smoke signals? I'm pretty sure those are supposed to be wisps. You know, ghostly stuff? Cuz it's a spirit? "The balls will metamorphose.." You mean they crack open? "these flaming enemies" Flaming? What the hell are you talking about? It's a chestnut. It's so obviously a chestnut. 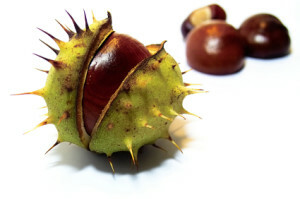 How can you not pick up on the fact that it's bleeding obviously supposed to be a chestnut? It's shaped like a chestnut, it comes out of a spiky shell like a chestnut, it's so obviously a chestnut! Even if you didn't think it was a chestnut, how do you see fire in this? Just because it's red? "for some reason, they're shaped like the Tao symbol"
Yeah, that really sounds like someone who's an authority on the game. Besides, it's a wisp spinning in circles. It's always gonna have that shape. So it's likely just a coincidence. Also, the name itself. "Wolfenboss". That's exactly the kind of name some random intern would come up with. NEVERMIND THE FACT IT'S NOT EVEN A WOLF! 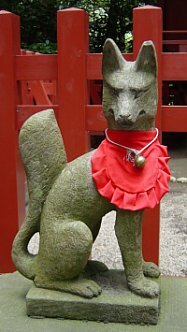 It's a friggin Kitsune! A fox! Not a wolf! It's such an obvious mistake to make, if you're not familiar with basic Japanese folklore. That's like 3 degrees of seperation from the game devs. Sorry, but I just can't see these names as canon. Even if they are the only names we have. I'd rather just call him "The Kitsune Boss" than Wolfenboss. If this was an actual member of the localization team, I'd accept them, but that seems highly unlikely. What do you think? Do you think these names are official? Like... OFFICIAL-official? What are some of the stupidest things you've seen written in "official" guides? Yeah, I'm not fully convinced the Mad Scienstein and the other guy in WL4 are the same character. A Japanese website is typically more credible than an American one in this case due to being closer to the source but it's hard to say really. Ankoopa and Turtle for the same character. No idea where "Ankoopa" even came from, but when I read it I think "anchor koopa" which makes sense, given the context. It's a Koopa, as heavy as an achor, and also he's anchored in position. I'd rather call them that than "Turtles". Also, ShyGuy I think you answered your own question there. I'm personally not accepting that crap as canon and I don't think anyone else should either. His Japanese name, Kezune, fits him much better. Guess NoA really wanted to make a Wolfenstein pun. He's not the only one with a European-sounding name, though, there is also Pesce. Maybe it's because the game was released in Europe before North America? ...... that's not even a good pun. It's a reference at best, if it's even intentional. It is a terrible pun. We should only accept fan created names as canon if they come from members on this very website. As Fancanon, you mean? Or Fanon, I guess. In that case, I propose "Ankoopa" be reinstated. It is hard to say which names from that site could be considered official, especially with a number of them being different from Dr Mario 64, like the frog enemy going by the name of Lump in DM64, while the website calls him Prince Froggy or this guy going by Helio in DR64, while the website calls him Yellow Belly. Whenever possible I go with the Dr Mario 64 names, since those are just the localized names, unambiguously official no questions asked and for everyone else, even if they don't make sense, I go with the website names, on the grounds that they need some name. While I think we should consider names that are invented by fans as canon until proven otherwise by an official source, I agree that it definitely shouldn't be done in this case. ¨The balls will metamorphose¨ seriously? He's not the only Kitsune enemy in the Wario Land series, either. The Flames in Wario Land II are also Kitsunes (Their Japanese name literally being Flame Kitsune), but they are much smaller than him, have red fur instead of yellow and wield torches instead of magic/wisps and chestnuts. He's not the only Kitsune enemy in the Wario Land series, either. The Flames in Wario Land 2 are also Kitsunes (There Japanese literally being Flame Kitsune), but they are much smaller than him, have red fur instead of yellow and wield torches instead of magic/wisps and chestnuts. I still like to call them firefoxes. If you think his English name is bad, the Spanish Wario Land 3 site literally just calls him "Coyote". Did it take you a month to finalize your point?